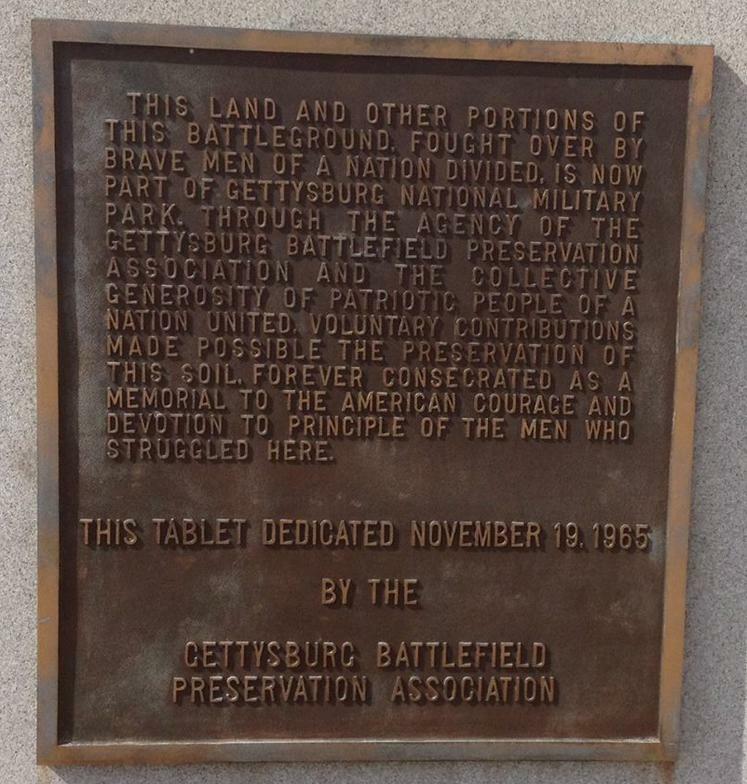 The year 2015 was the 50th anniversary of the dedication of the Gettysburg Battlefield Preservation Association Monument in the Gettysburg National Military Park. The monument on Howard Avenue was officially unveiled on November 19, 1965. It was a notable exception to the park’s policy of allowing only monuments related to specific actions of the battle in July 1863. The National Park Service permitted the placement in gratitude for the GBPA purchasing the McClean Farm and turning it over to the park. The farm had been the scene of heavy fighting on the first day of the battle. The Park Service eventually restored the house and barn. Among those present for the observance was Craig Caba, second from right in the photograph. Caba, a trustee of the GBPA and former president, was present at the original dedication. Also pictured, from left, are GBPA board of directors member and author Cooper Wingert, board of directors member Jay Purdy, and vice-president of administration Stephen Reed. To Caba’s left is Pennsylvania state Rep. Harry Readshaw. Caba is the sole remaining charter member of the GBPA. Addressing the GBPA dinner the prior evening, Caba recalled his early memories of the GBPA. Those memories include riding in the back seat of his father’s car as he drove former President Dwight Eisenhower around the park. The two discussed portions of the battlefield that should be protected from commercial and residential development.